WEATHER: cloudy all day, with some bright, sunny warm spells. It clouded over late afternoon, but it stayed dry. We met up at 6am in anticipation of a short walk before breakfast, but just as we were about to leave we were called for breakfast and so abandoned our walk. It was 6:45 when we finally left the lodge, we only walked about 50 meters to a small, secluded watch-point and feeding station which the local guides had set up in order to watch Antpittas. 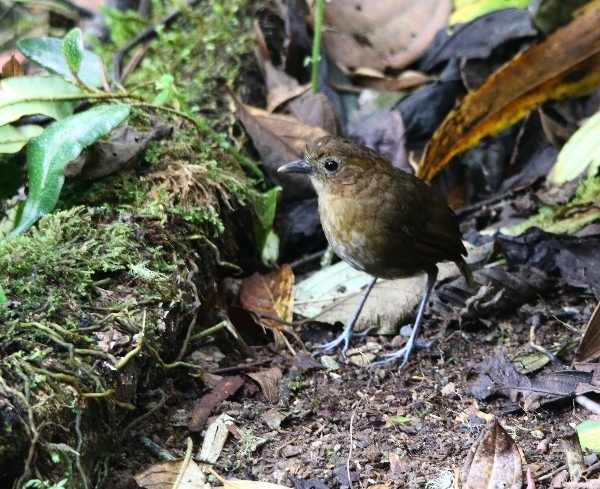 In this case it was the Bicoloured Antpitta which took about 40 minutes to arrive, but it was worth the wait. 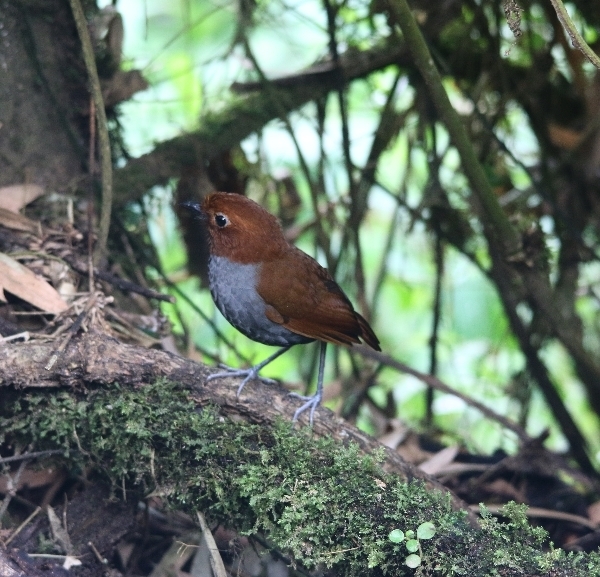 Another two feeding stations were visited throughout the morning where we managed to see another two species of Antpitta. These rare and timid ground-dwelling birds have become accustomed to the calls of the local guides who provide grubs and worms for the Antpittas in exchange for turing up on cue. 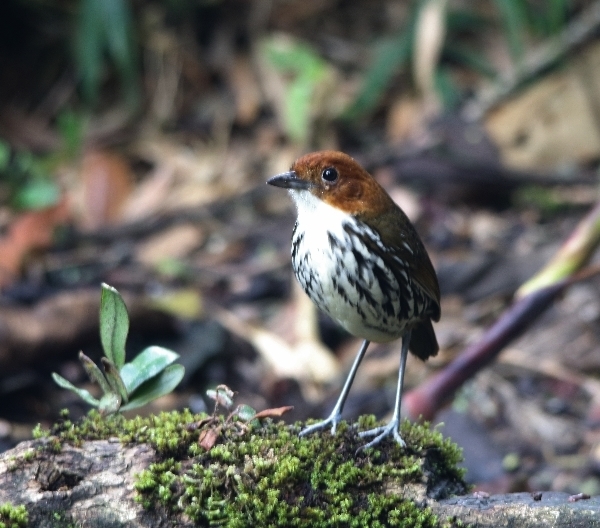 In between the Antpitta stake-outs we had some great birding along the rain forest tracks. The first 3 hours were undoubtedly the best especially at the top of the ridge where a wardens house was sited in an open area. 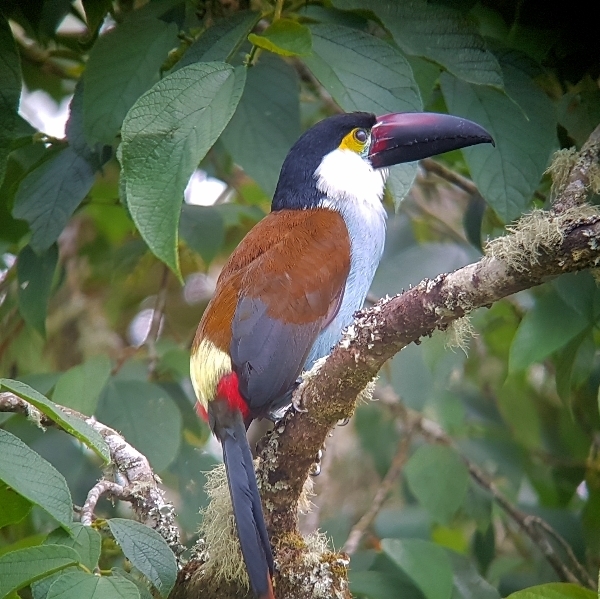 A fruiting tree attracted a good number of birds including the Black-billed Mountain-Toucan, Crimson-mantled Woodpecker, Beryl-spangled, Blue-and-black, and Blue-necked Tanagers, also Blue-winged Mountain Tanager and variety of other species. There were long gaps between finds as we climbed up to the ridge (2500 meters) but some great birds were seen along the top of the ridge. The other two Antipitta stations produced Chestnut-crowned and Brown-banded Antpittas, also along the main track we saw Southern Emerald Toucanet, White-tailed Tyrannulet, Glossy-black Thrush, Yellow-bellied Siskin and Gray-browed Brushfinch. 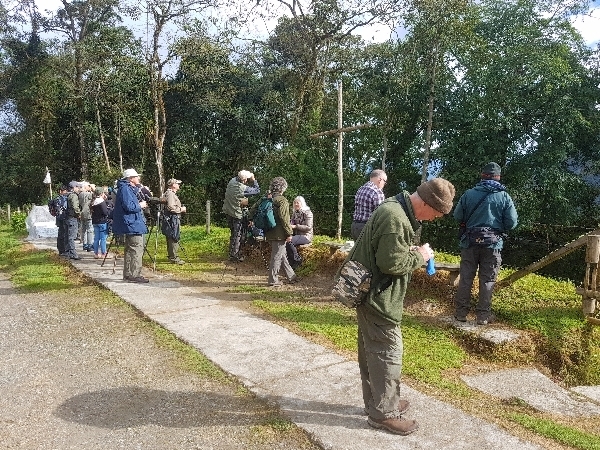 Birding along the ridge was much slower as we never bumped into a feeding flock, sightings were made of a couple of special birds in the shape of Pale-edged Flycatcher, Capped Conebill, Sharpe’s Wren and Slaty-backed Chat-Tyrant. 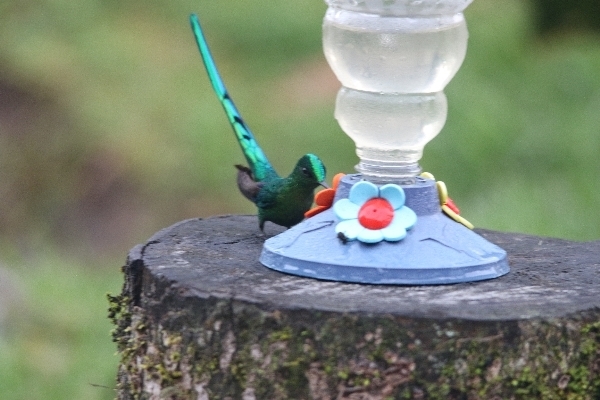 We had lunch at the lodge and then had an hour watching the feeders, a Tourmaline Sunangel was added to our hummer list and a White-sided Flowerpiecer showed well. Yet again our afternoon was very slow with few sightings. The best of the bunch was Black-billed Peppershrike, Black-and-White Warbler, another Chestnut-crowned Antpitta and another Slaty-backed Chat-Tyrant. Due to a mishap with our reservation at Rio Blanco Lodge we had to stay in town, a very nice hotel in the centre of Manizales provided excellent rooms and a delicious evening meal. Tomorrow we are heading upinto the Paramo reaching heights of nearly 4000 meters, it will cold up there.